I’ve had a lot of questions about C-Curve Scoliosis recently so we are starting a series of new videos to help answer those questions. We’ll start out by explaining what is a C-Curve Scoliosis. Then we’ll follow that up with how to Wedge for a C-Curve Scoliosis. Finally we’ll put up a video for you with exercises for a C-Curve scoliosis. In a nutshell, a C-Curve is the handy-dandy name given to a scoliosis curve that is longer than most. 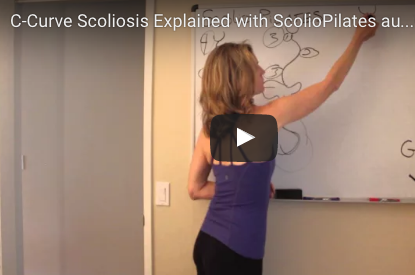 Most scoliosis curves stay in their own neat little compartments, or levels, of the spine. Most curves will stay in the lumbar, thoracic or cervical spine: when the spine changes levels, the curve changes direction. But with a C-Curve the curve extends beyond one level. Most commonly we see C-Curves that travel from the thoracic (mid-back) to the lumbar (low back) levels. But enough chatter. Maybe the video will help. Let us know if you have any questions!